We’re about to begin our first “real” Azure project and I needed to wrap my head around event logging and trace writing in the cloud. Any proper application running in any cloud needs this sooner or later. I quickly noticed that the information around Azure diagnostics was all over the place, and some things seems to have been changed in newer versions of the Azure SDK. So, something I thought was going to take me just a few minutes to figure out took about a day, but I think I got it sorted in the end and here’s what I did to get simple event logging and trace writing to work for our web role. First thing I had to understand was how data for all kinds of diagnostics is handled and stored in Azure. You need to define which kinds of diagnostics data you want to capture, and you need to define where Azure should transfer the data captured so that you can download them or look at then with various tools. You also need to define how often these values should be transferred. I’ll get back to that a bit later. EventCreate /L Application /T Information /ID 900 /SO "MySource" /D "my custom source"
NOTE! Make sure the cmd-file property for “copy to output directory” is set to “copy always” or “copy if newer”. So now when your application is deployed the cmd-file should be executed with elevated permission and create the event log source you specified. EventCreate is a tool which is available on the Azure server so it’s nothing you need to worry about. Same thing should work well on your local dev machine too. If you capture performance counters and such, these will be written to other tables. To actually see what’s been written to these tables, you need to either download the data from the storage tables via APIs, use the server explorer or some tool, like the one from Cerebrata – “Azure Diagnostics Manager” – which seems to do the job pretty well. As far as I know, there is no proper tool available from Microsoft. Be that as it may. Please, feel free to write comments below and add tips and tricks about handling diagnostics in your Azure application. I’d like to know more about the Transfer Period and Buffer Quotas and how they may affect the application and maybe also the billing… I’m sure there are loads to learn about this . Now, unfortunately everyone in the project has to have the TFS Power Tools installed to make this work. Whish this was in the box from start. For various reasons I’m using MSTest for my unit tests and I have this console app which generates a PDF file from an XML file that needed some tests. So, when moving the unit tests over to a TFS build server, having hard coded paths to test data files is not a good idea. 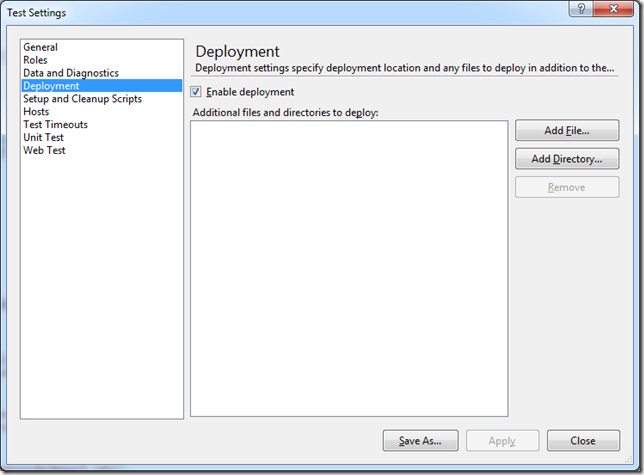 The recommended way of doing it is to use the DeploymentItem attribute. Also, when calling an exe-file which does Environment.Exit() and catching the exit code from the unit test is pretty straight forward by using Process.Start() and checking the ExitCode property. That’s all you need to do. 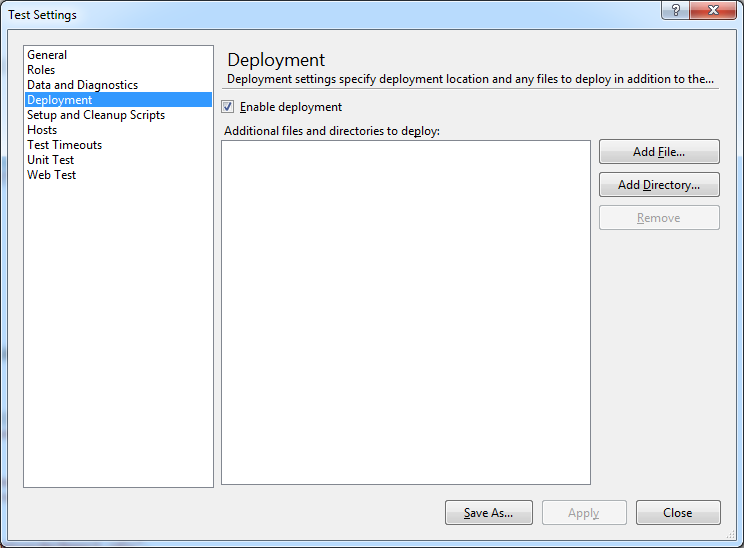 And note that you may actually have to exit and restart Visual Studio to make it work. I never got the files deployed until I did that restart.